Deuces never lose’ meme has given all of us poker players a good laugh at some point, but if you’re the one holding aces, and deuces hits a two-outer on the river, now that ain’t funny. It’s more like a rage-quit moment. Well, no more do you have to keep the phrase ‘Bad Beat’ in your dictionary. All that is required to never lose a hand? Just a flick of your finger to take out All-In Insurance, and the rest is history. 3. Check your payout (what you’ll get), premium (what you put up), odds. · Insurance will be available if you are the sole favorite (by hand) to win the largest pot. · Insurance will additionally cover other smaller pots as long as you are the favorite for the relevant pots. · Up to 1/3 coverage on the turn, and full coverage available on the river. · Chop cards will be considered as outs. 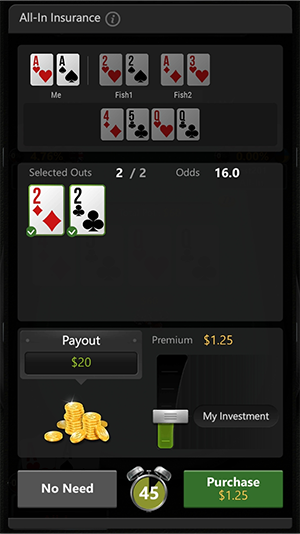 · If you remain as the pot favorite after taking out insurance on the turn, mandatory insurance will be taken out and you may be unable to exclude outs on the river. · You will not be able to exclude outs if there are more than 20. · A mandatory sub-insurance will be applied to all cards you exclude from your main insurance. Say good-bye to WHAP, TILT, BAD BEAT emotes, or face-palming yourself, as long as you remember that All-In Insurance has your back!